Yes, you heard it right! Me too joined the club of sirudhaniyam / millets, after my parents bought me these during my recent India visit. My mom started using siruthaniyangal as she wanted to change her eating habits coz of her health issues. So she asked me too to include these in our cooking and bought me these. My dad packed everything with a piece of handwritten paper with the millets name in each so that it can be easily identified. Sure it is looking very similar to each other. I was very much worried before handling and cooking these millets, but its not complicated at all. Taste also better than the oats. Not comparing them, but just saying. So far I have made only this paniyaram and upma with barnyard millet (kuthiraivali). I loved the upma too, it was just like arisi noi upma. Soon will post the upma, which is easy and basic to cook. Now this flavorful thinai sweet paniyaram. Since Thinai is Lord Murugan’s favorite, you can make this on Karthigai deepam day too. Wash once and soak the millet for 2 hrs. Place it in a blender with very little water, as it gets water after grinding easily if water is more. Grind smoothly and transfer to a container. Add powdered jaggery, rice flour, wheat flour, coconut, salt and powdered cardamom seeds. Mix well and set aside for 2 hrs. After 2 hrs mix well again, add a pinch of cooking soda and heat the paniyaram pan, pour 1/4 tsp oil in each shallow and pour this batter. Cook covered in medium flame for 2 minutes. Flip and add more oil or ghee and cook until it turns golden brown. You can add half a banana too to this batter to make it softer. Make sure the batter is not water or too thick. If watery, you may not be able to take from the paniyaram pan. If too thick, inside will not be cooked. So adjust the consistency. To make the runny batter thick, you can add more wheat flour. Sesame oil and ghee makes it smell awesome, so its recommended. Giving standing time makes the paniyaram softer. This paniyaram slightly has the thinai’s flavor, which very well goes with jaggery. Enjoy hot! The picture in itself is very tempting…. gonna try this for sure asap. Even my amma started adding more millets in her cooking. Lovely looking paniyarams. 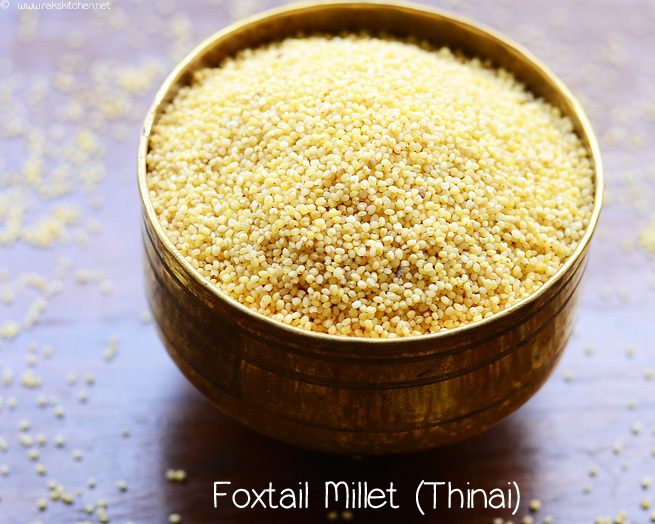 Just a doubt…is thinai(fox tail millet) same as quinoa ? healthy and delicious millets!! I have also started using them for a year now!! Can we make dosai with this batter? Hi, at which stage should we have to add banana? You can add just before making. Mash it well and mix in the batter. Can we make this millet sweet paniyaram a day on advance? Will it become hard? Yes, if you make before day it will become hard. Looking Good. Thanks for sharing nice recipe. Hi Raji. Is foxtail millet and hulled millet same? Can I use hulled millet to make this recipe? I am not very sure, about hulled millet. But looks similar. So you can sure try.